Wild, rugged and majestic are just a few words to describe Nootka Sound and Nootka Island off the West Coast of Vancouver Island. Often referred to the birthplace of British Columbia. Weather can be unpredictable and only fit experienced hikers should hike the area or go with an experienced guide. It is very important to be well prepared. Approximate total hiking time is 25 hours. Approximate distance is 35 km. (22mi.). Pool south of Calvin Creek. Paddle along Nootka Sound either in canoe or kayak. Along the trip visit Crawfish Falls where Calvin Creek enters the Pacific Ocean. 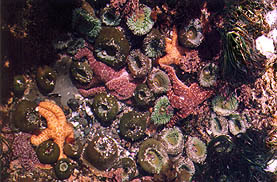 Admire the variety of inter-tidal life at Bajo Point. 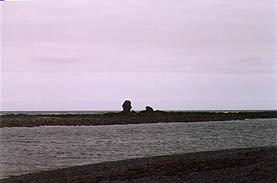 Then continue towards Yuquot (Friendly Cove). Again being well prepared is very important. While discovering Nootka Sound stop and visit many of the historic sites around the island. Wolves, sea otters, sea lions, black bears, cougars, and bald eagles can be spotted and viewed along Nootka Sound and Nootka Island.